Lunes Bijoux is located in Luc Sur Orbieu, Aude, France. The Atelier / studio opened to the public in March 2006 after a massive renovation project which saw the entire barn & maisonnette transformed into a work place and a beautiful home. Kylee Milner is the driving force behind Lunes Bijoux with husband Andy becoming more and more involved. 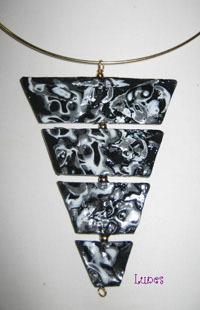 Kylee creates jewellery which has impact, it takes a certain degree of confidence to wear her designs. Kylee started working with glass and gemstones over 5 years ago after an inspirational visit to a jewellery shop in Pézenas, France. Having become frustrated with the lack of ownership they offered she set herself the challenge of designing items from scratch using polymer clay. Since then she has not looked back. A visit to Lunes Bijoux in Luc Sur Orbieu will reveal the extent of Kylee & Andy's hardwork. Semi-precious gemstones, dichroic glass, polymer clay are all on display. 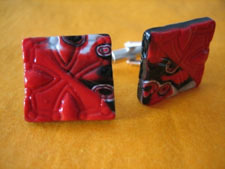 The jewellery range extends from necklaces, bracelets and earrings right through to cuff links and scarf pins. One of the most recent developments on the polymer clay front has been the appearance of stunning art objects comprising of wine & champagne bottle stoppers, salad servers and pizza cutters. The ideal and unique gift. Kylee & Andy have big plans for 2008 - keep your eye on her blog http://bijouxandbanter.wordpress.com/ or see the Lunes Bijoux website http://www.lunes.moonfruit.com for more information!